At the perfect blossoming stage in the life of a tulip, the petals will stand erect showing off their vibrant colors and highlight the gardens which line the streets in the town of Niagara-on-the-Lake in Ontario, Canada. Bright red, orange and yellow colored tulips appear during the Spring and add a delightful addition to the all ready charming town. The gardens on either side of the street in Niagara-on-the-Lake display various hues as tulips blossom in red, purple, red, orange and yellow hues and it is not just the beauty of the red and yellow flowers displayed in this picture which beautify the town. During the daylight hours, the tulips open to their fullest but as the evening hours close in, the tulips begin to fold together and close until the light at sunrise. 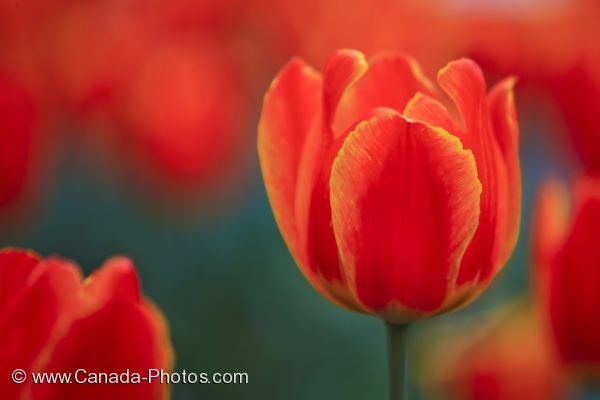 Picture of the red, orange and yellow tulips in the garden along the streets in the town of Niagara-on-the-Lake in Ontario. The historic town of Niagara-on-the-Lake is charming at the best of times but during the spring, the gardens come to life when the tulips flower. This close up picture of a tulip shows the intermingling of the colors and the true beauty of this flower in blossom. Colourful tulips, Tulipa, lining the streets of Niagara-on-the-Lake, Ontario, Canada.